Thule 9708 Hang On 4 Bike Rack - Cycle Carrier - Tow Bar Mounted. High Strength 4 Bike Cycle Carrier. Adjustment Free Fitting (ISO Approved Towballs). Folding Design For Easy Storage. Tilting Function Allows For Easy Boot Access. Featuring a high strength towball mounting the Thule 9708 HangOn cycle carrier is built to handle the weight of up to 4 bikes effortlessly (60kg maximum), with the durable coupling featuring a simple 1 bolt tightening operation, enabling adjustment free mounting on ISO approved towbars. A tilting function allows for easy boot access without the need to remove the bikes or carrier itself, and the folding design enables easy storage when not in use. Supplied with bike mounts, suitable for frames from 22 to 70mm in diameter, and a securing strap to keep everything in place. Designed for flat crossbars, bikes with non standard frames (WSD, full suspension and BMX) may require an adapter (981) to allow for correct fitment, towbar locks (957) and cycle locks (538) are also available for increased security. Suitable for 4 bikes (maximum weight per bike = 15kg). Ensure bikes do not obscure lights and/or numberplate, if this is the case use of a lighting board and additional numberplate are required by law. PLEASE NOTE: Picture For Illustration Purposes Only. Tweeks Cycles' parent company, Demon Tweeks was established and founded in 1971 by Alan Minshaw to service the needs of the Motorsport Competitor. Alan, an accomplished racing driver since 1958 and former motor trade salesman, identified the opportunity to supply everything the racer could need from one source. His principles of offering top products, quality service and rapid availability are as important to Tweeks Cycles today as they were to Demon Tweeks in the beginning. For over 40 years we've been performing at the head of the pack, constantly chasing new products and suppliers to get you out there, doing what you love. This philosophy has been very much embraced by the team at Tweeks Cycles. Our extensive range of bikes, clothing, components and accessories boasts some of the largest names from all over the world, with leading brands such as Shimano, Campagnolo, Sram, Raceface and Continental to name just a few, you'll find everything you need to get you out on your bike! Within a staff totalling over 130 is a dedicated Cycles sales team servicing upwards of 3000 telephone, fax and online enquiries received everyday from the UK and the rest of the world. Subject to the following conditions. Items are received in a resalable condition. (We reserve the right to levy a charge to replace product packaging which is damaged or defaced). This does not affect your statutory rights. We cannot accept any items which have been specially ordered for you or manufactured to your specification for return. Please help us to help you. You may require it on the event of a claim with your carrier. Tweeks Cycles are not responsible for any labour charges incurred during fitment or removal of allegedly faulty (or incorrectly supplied) parts. SHORTAGES & DAMAGE - Please advise us of any problems with shortages or carrier damage within 5 days of receipt. We regret that beyond this time, due to circumstances beyond our control we may be unable to process your claim. Offering servicing for all types of bikes, our fully equipped service centre is recognised by Shimano, Park Tools, Campagnolo, Fox Suspension and many more. Equipped with the latest professional tools and equipment, you can be confident that our experienced and qualified technicians have the knowledge to carry out all work quickly and professionally. Highly qualified & experienced technicians. Approved service centre for the majority of our suppliers inc Shimano, Fox Suspension, Campagnolo &mp; Scott. We're located in Wrexham, North Wales. Approximately 20 minutes drive from Chester, 45 minutes from Manchester, 2 hours from Birmingham, 4 hours from London and 5 hours from Edinburgh. Superstore & Service Centre Open: Monday - Saturday 8.30am - 5.30pm. Need to talk to someone? Tweeks Cycles75 Ash Road South, Wrexham Industrial Estate, Wrexham, North Wales. 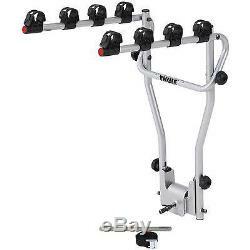 The item "Thule 9708 Hang On 4 Bike Rack Cycle Carrier Tow Bar Mounted" is in sale since Thursday, June 05, 2014. This item is in the category "Sporting Goods\Cycling\Car Racks". The seller is "tweekscycles" and is located in Wrexham. This item can be shipped to North, South, or Latin America, to all countries in Europe, to all countries in continental Asia, to Australia.